It's taken over a few months to catch up on Sepultura's thirteenth album not out of laziness but because it's genuinely hard to summarise. I've listened multiple times and loved and hated it on alternate listens – however dismissive you want to be about modern Sepultura, there's no denying that it's a lot more interesting than Soulfly currently is. The Mediator... isn't actually a concept album, as the last couple have been, although it is heavily influenced by the 1927 Fritz Lang film Metropolis and, also like the last couple of albums, is heavily overthought. There's been so much effort in the thematic side of things lately from Sepultura that it can sometimes feel that the music itself comes a distinct second. Well, you couldn't say that about Kairos, which was the best thing the band have produced in years, and The Mediator... follows in those lines, although is completely different. Confused? Yep, you will be. This is the least Sepultura-y the band have sounded in years, although the tribal elements are still present and correct, mainly thanks to new drummer Eloy Casagrande (ex-Andre Matos) but also due to upping the viciousness and making this seem like far less of a 'fun' album than Kairos. Partly this is due to the lack of mid-tracklisting cover songs, but also due to the fact that this is a full-frontal assault for much of the album, Derrick Green's voice a twisted snarl, Andreas Kisser working overtime on those riffs, often thrashing, just as often not. Said new guy Eloy is just 22 but is a very capable drummer, filling in perfectly for the departed Jean Dollabella, and comparing well to Dave Lombardo, who makes a guest appearance on drumstool in one track here. The problem comes when you try and assess just how interesting the material here is, and although Sepultura have made an effort with the songwriting here, often it falls short. Take album opener Trauma of War as an example, building from ambience to noise, and bursting into thrashy life, sounding very much like recent Slayer as the raw vocals are buried beneath a thick layer of guitars – the energy is there, but it's staggeringly uninteresting even before you remember that Sepultura did this sort of thing on Chaos AD, and did it better. Is Sepultura now just content to make pale imitations of itself twenty years ago? It's a harsh question to ask, as the band are clearly striving ceaselessly to prove that they aren't. The six-minute The Vatican is a genuinely good track, a fuzzy opening with distorted cello and choirs suggesting something epic, and soon paying off with technical and interesting thrashing, building almost to death metal levels of heaviness before devolving back into riff worship from Andreas Kisser's ever-underrated guitar. Derrick Green is at his best, a maddened howl more outraged and angry-sounding than the man he replaced has managed in a while, but even these two can't make so-so material sound as good as it needs to be. All too often the threat of the music is never made real, the songs seemingly all being held back by something. Impending Doom never takes off from its mid-paced churn, for one, and Manipulation of Tragedy seems to have taken Deicide at their most turgid as its main musical inspiration (although it's saved by Sepulturisms like an exotic drumbeat and plenty of Kisser's soloing). The likes of Tsunami and The Bliss of Ignorants are thrashy enough, but filler in the album tracklisting and seem never to end, while Grief is a melancholic break with moments of clean singing that is all somehow utterly unengaging. 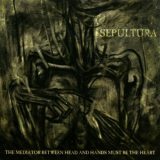 Producer Ross Robinson (yes, of Roots fame) may have pushed the band to be more violent in sound, but unless you have an especial love of the recent Sepultura sound, The Mediator... will likely be rejected by both head and hands. It promises much from that dark, artsy cover, and the music is suitably dark and heavy, but Sepultura haven't made that golden goose of an album yet that will persuade everyone that the Cavaleras didn't take the magic with them.